Scott Morgan, the founder and CEO of the school leadership training program Education Pioneers, announced Tuesday he will step down from his role at the nonprofit in June — one day shy of the organization’s 15th anniversary. Melissa Wu, who has served as the organization’s chief program officer since last year, will become CEO effective June 15. Morgan founded Education Pioneers in 2003 after serving as legal counsel at Aspire Public Schools, a charter school network with campuses in California and Tennessee. A former teacher and attorney, Morgan said he recognized at Aspire a benefit to building leaders by bringing together diverse candidates with backgrounds in education and business. More than a decade later, the organization he founded has trained nearly 4,000 education leaders through its fellowship programs focused on education leadership. Although fellows typically have professional training outside education, most go on to work in the field, in areas including data analysis, operations, finance, and human resources. As the Oakland, California–based nonprofit approaches its 15th anniversary, Morgan said he reflected on Education Pioneers’ “core values,” which say one person or idea alone cannot solve the complex challenges public education is up against. Stepping back to look at the organization’s next chapter, he discovered it could benefit from a leader with different skills and a new perspective. 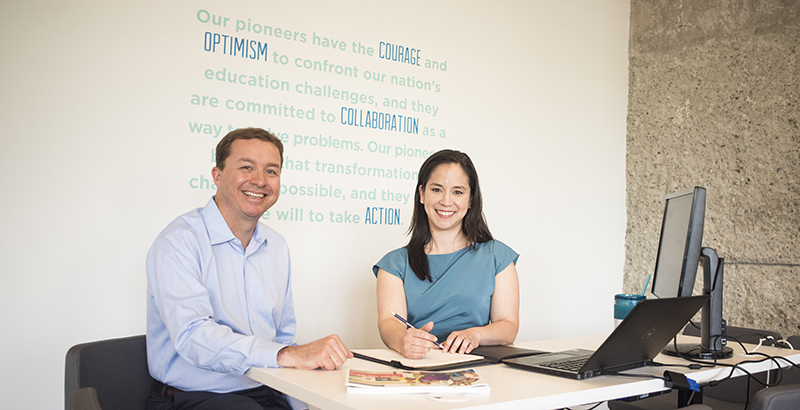 Wu came to Education Pioneers in 2017 after more than six years at TNTP, a national education nonprofit that recruits and trains teachers. Wu began her career at the TEAK Fellowship, a New York City–based after-school program that helps students from low-income families get into and succeed at top high schools. She previously hosted Education Pioneers fellows on her team at TNTP, she said, which helped motivate her decision to join the organization. “[Education Pioneers] has built this strong network and this large body of alums who are doing incredible work in the field, so it felt like an exciting moment to me to both think about how you sustain that momentum, sustain it with real quality, and to think about what the next phase would look like,” Wu said. Education Pioneers began with a class of nine fellows working at seven education organizations, but it now trains nearly 400 education leaders per year. The nonprofit has partnered with more than 750 organizations across the country. Education Pioneers offers a 10-week summer fellowship program, composed predominantly of graduate school students, and a 10-month impact fellowship, in which emerging leaders are recruited and placed with education organizations to focus on data and analytics and strategic project management. School districts and charter school networks make up more than half of partnerships, but the group also places fellows at state education departments and other education nonprofits. Among Education Pioneers alumni, 53 percent identify as leaders of color, though the group has put a greater emphasis on diversity in recent years, Wu said. Disclosure: Education Pioneers and The 74 receive financial support from The Walton Family Foundation and the Carnegie Corporation of New York. 74 Senior Editor Andrew Rotherham serves on Education Pioneers’ Washington, D.C.–area advisory board.